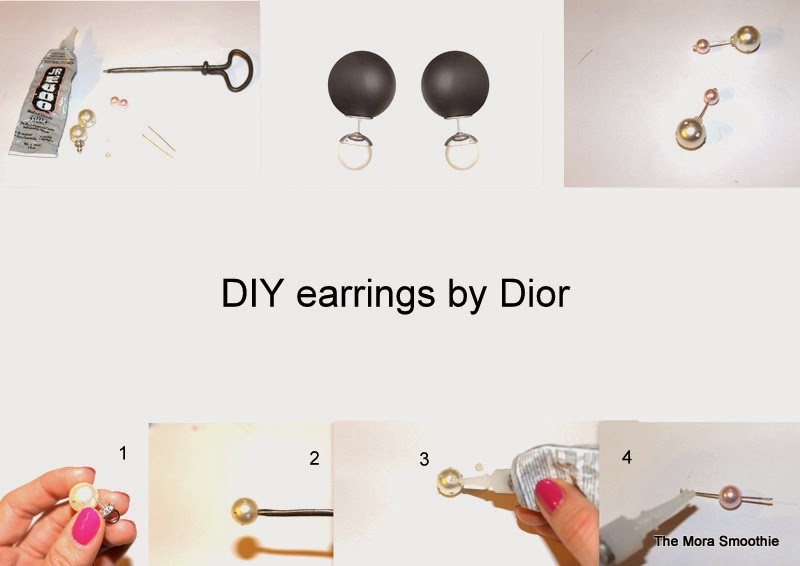 The Mora Smoothie fashion blog, DIY fashion by Paola Buonacara: DIY earrings by Dior! Hello to everybody, and have a nice week. Today here we are with a new DIY, earrings inspired by Dior, make them is super easy, but the effect is amazing. Essential: 2 big pearls and 2 standard pearls, tacks for pearls, transparent hook for earrings, glue, awl to enlarge the hole of the pearl. Tutorial: first I enlarged the hole of the larger pearls, then with the glue I inserted the hook for earrings and finally in the smallest pearl I did pass the tack and I stuck it with a bit of glue, what do you think about? A big kiss and thanks for always being there! Oggi eccoci con un nuovo DIY, gli orecchini ispirati a Dior, farli è super semplice, ma l'effetto è spettacolare. Necessario: 2 perle grandi e 2 perle normali, chiodini per perle, gancio trasparente per orecchini, colla, punteruolo per allargare il buco della perla. Tutorial: ho prima allargato il buco delle perle più grandi, poi ho con la colla inserito il gancio per orecchini, ed infine nella perla più piccola ho fatto passare il chiodino e l'ho bloccato con un pò di colla, che ne dite? Un bacio grande e sempre grazie di esserci! good downloaded open up resource mass media participant. Kodi Kodi App is definitely present for the two types of the great. awesome features like Tales, Filter systems, Lenses, Trophies, etc. snapchat latest update Not really extremely longer before, Snapchat presented a characteristic referred to as nice. good additionally be contributed to the specialized site to https://imobdro.com the freemium one, and also the an additional one is great. One aspect that makes the skull so popular is its versatility. By pairing a skull with wings, hearts or butterflies they can be given a feminine look, whereas teaming them with flames, crossbones or snakes gives them a powerful presence that portrays strength and bravery.